We all do it: we buy an ingredient for the purposes of making one must-do, enticing recipe from this Sunday supplement or that. Said dish requires but a spoonful or two of said ingredient, and so the rest is left to fester in the back of the cupboard. Every so often it surfaces (have you noticed the almost volcanic activity inside most larders?) and you make a mental note to do something with it, and then it sinks out of sight again. Eventually you throw it away. 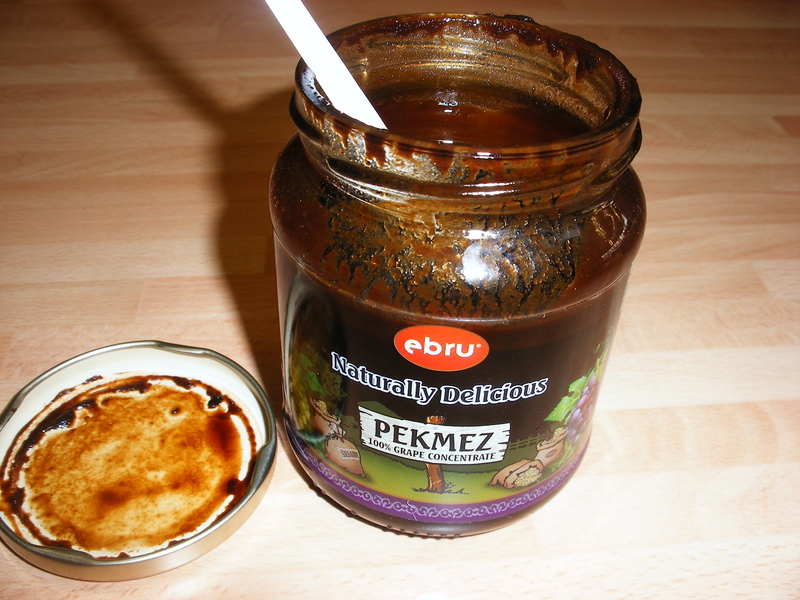 Well we’ll be pretty cross if you do that with your pekmez – it’s one of our current faves (actually my husband dreads me finding a new favourite ingredient as it means he’ll be eating it for breakfast, lunch and dinner). Pekmez actually just means ‘paste’ in Turkish, and can be used to refer to anything from date syrup to pomegranate molasses. The Arabs use the word ‘dibs’, whilst Iranians call sweet syrups ‘shereh’ and those with a savoury application ‘rob’. The most common varieties in Turkey are mulberry, carob and grape, and it is the grape one which is most well known and easiest to source in the West. There is no great mystery to its preparation: it is simply boiled, condensed grape juice. You can make it yourself ‘easily enough’ – this quaintly fascinating video shows you how. Fruit pastes are a marvellous way of conserving and enjoying fruity goodness throughout the year: they are full of trace minerals, and carob syrup especially is a valuable source of iron. Mix it with tahina to make a breakfast fit for sultans. Spread the resultant gloop on bread – see: who needs Nutella? Try mixing with tahina and ground walnuts and cardamom and packing the mixture into a flan case: decorate (with walnuts) chill well and you’ve got an ace and easy pud. You’ll all be letting us know if there are any pekmez ideas that we’ve missed, yes? This entry was posted in Postcards from Veggiestan and tagged dolmeh, grape paste, mulled sangria, pekmez, Veggiestani pantry. Bookmark the permalink.